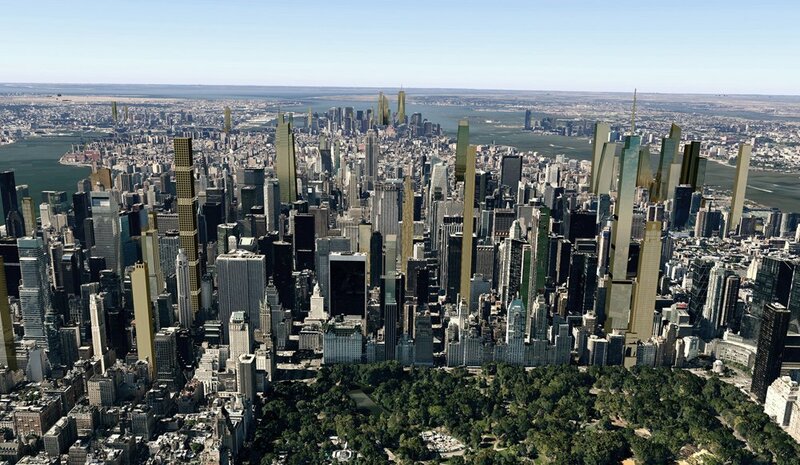 The three sites new to the market have the potential to be super tall. At 1710 Broadway, on the north end of Times Square, the owner previously planned a nearly 1,000-foot spire; 520 Fifth Avenue followed suit; and 200 Amsterdam Avenue has the potential to become the tallest building on the Upper West Side at 601 feet. They also have alternate revenue sources. 1710 Broadway allows for a digital billboard that would bring in millions in annual rent, and 520 Fifth Avenue will have prime retail space. Low-rise residential projects usually cost around $400 per square foot to build. Towers, however, can command up to three times that amount due to their complexity and use of special materials. Plus, the more expensive units there are in a building, the longer they take to sell, pushing up project loan interest costs. And with more than 6,000 new condo units planned for 2015, the risk becomes even greater. The recent $100 million sale at One57 is a good sign for developers, though, as is the growing number of foreign buyers investing in Manhattan real estate. According to CityRealty‘s Dan Levy, “For real estate investment hot spots for the wealthiest like New York, property is likely to get even more expensive, as economic and political turmoil make other markets look less attractive. Hong Kong, Moscow, and Dubai are no longer ‘safe’ investment spots compared to New York and London.” Levy expects nearly a dozen ultra-luxury apartments in Manhattan to sell for more than $100 million each in 2015.